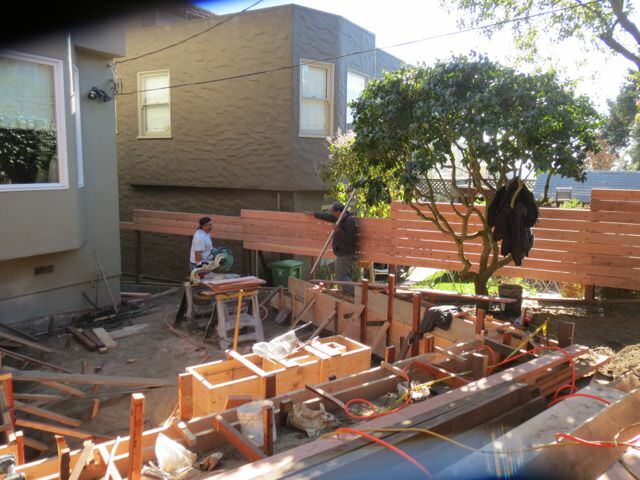 Our first project in 2014 brings us back to West Portal and its a large one for San Francisco Standards. 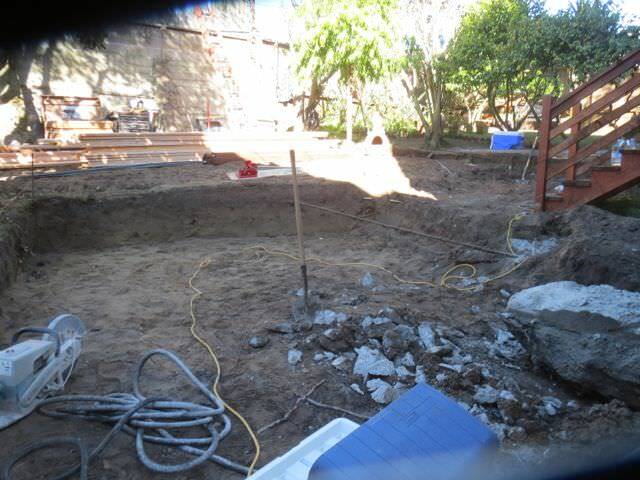 Below is a shot of the rear before construction. 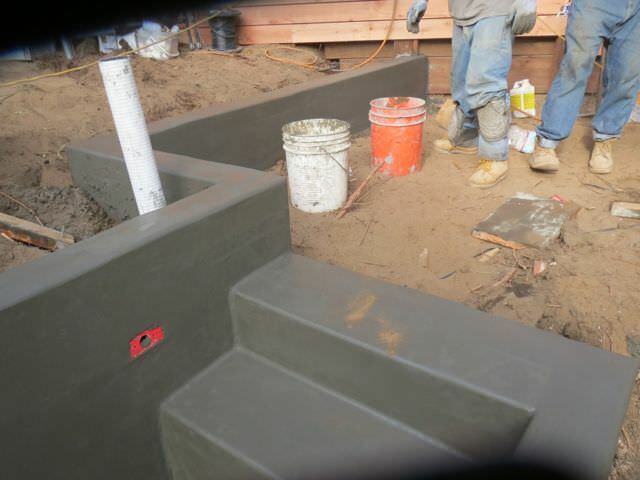 We’ll be constructing new fences and sunken patios with contemporary concrete retaining walls that are becoming so popular these days. 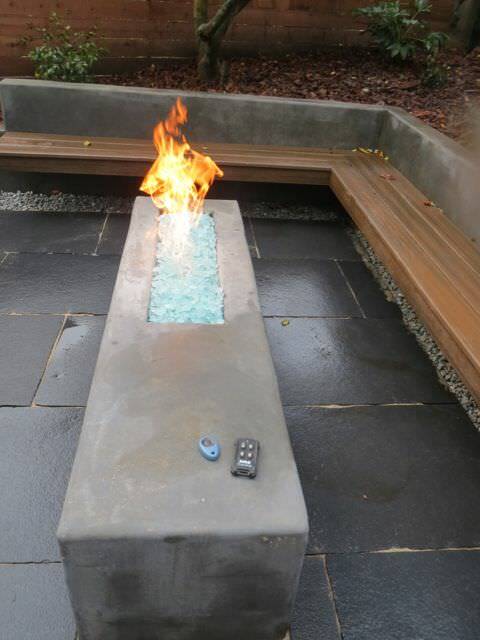 Also included is a gas fire pit, stainless weir waterfearure, decks, lights and much more. The end of 7 days. 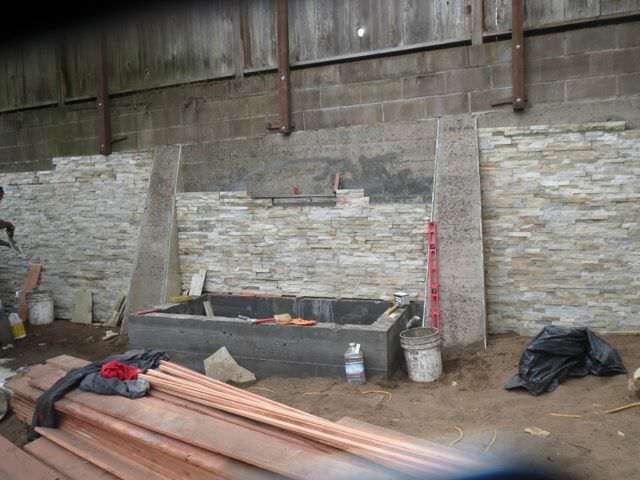 After removing about 40 cubic yards of debris, concrete and dirt, you can see the forms for the new wall going up. 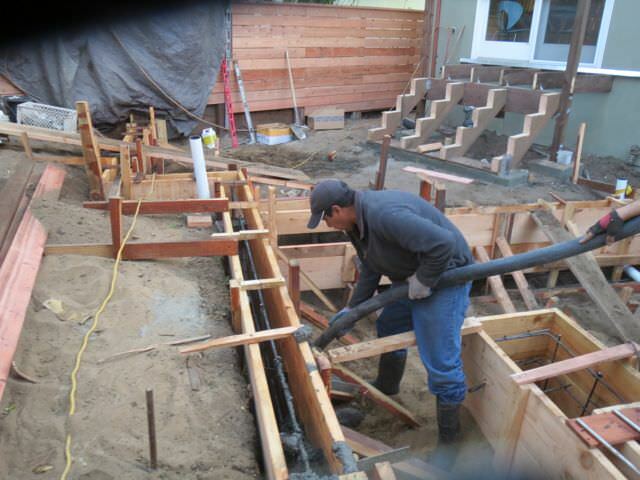 January 24, 2014, the end of week 2, we pumped 12 yards of colored concrete (silver smoke), removed the forms on the same day and hand troweled for a smooth finish. 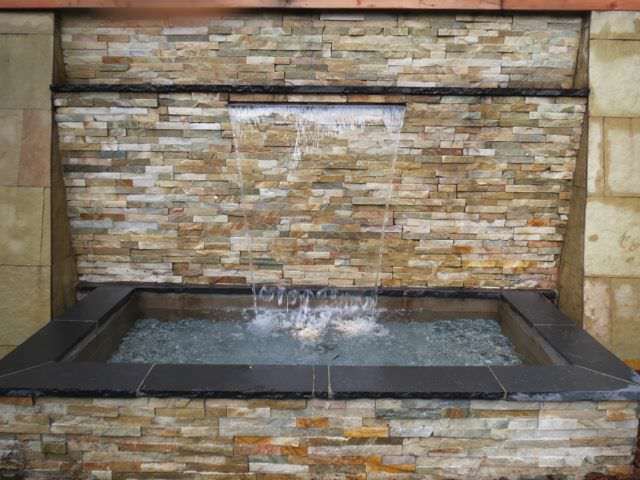 Also being installed is the rear wall stonework and water feature. January 31, 2014: Day 18. 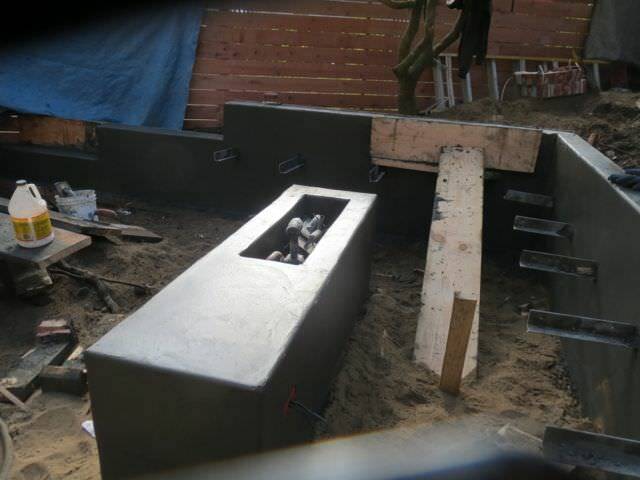 Things are moving along as planned and we should be done in about 7 days. 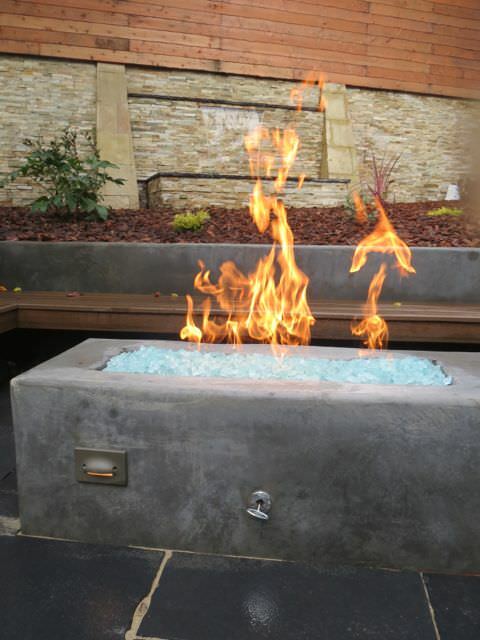 Below you see a test fire of the natural gas fire pit. We installed a 30″ H- burner but now I’m thinking I was over ambitious. 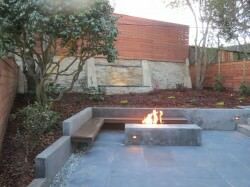 The unit puts out so much heat that I’m concerned it may create superficial fissures in the concrete where its narrow. 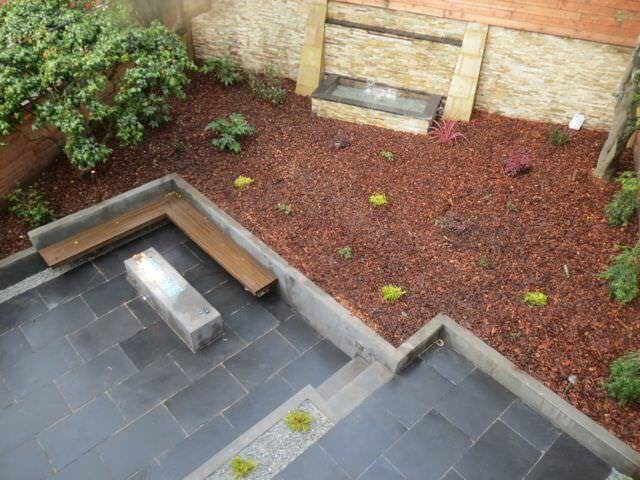 Although the fire pit is a big chunk of steel re-enforced concrete, expansion and contraction of such material may cause an unsightly effect. After a discussion with my clients, we are downgrading to a 24″ T-burner. Stay tuned for a night shot. 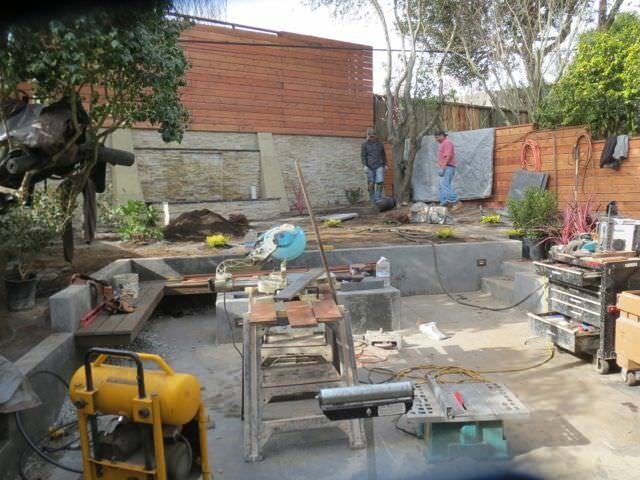 A photo of Manuel in the background working on the “stainless weir” water feature. 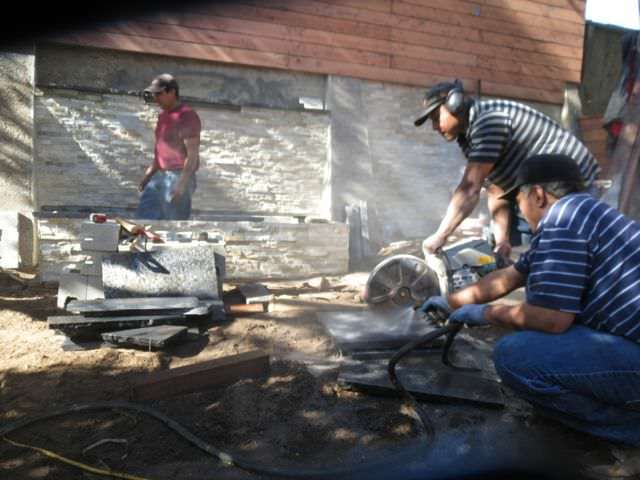 Also, Mario in the foreground, ripping a piece of black limestone for installation. A word about these two dedicated workers: From the pueblo of San Mateo, Mexico, they’ve been with me for 12 plus years and are the single greatest asset to my operation. They are skilled, dedicated and with an unmatched dynamite work ethic. Without them, I simply would not be able to do an installation like this. 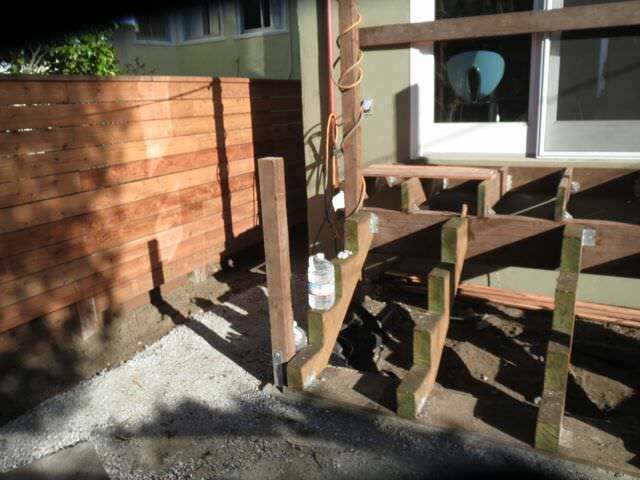 A photo of stair stringers made from 4″ pressure treated material. All cuts have been sealed with “copper green”. I’d say its elephant proof.